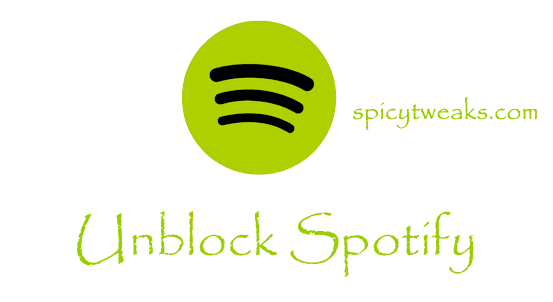 Unblock Spotify and access it outside US, UK or other European countries. Read to know tweak to access in India or other country where it is not available. So you want to access Spotify in India? It is a very brilliant service and allows you to listen thousands of songs for free. There are many regional Indian songs on Spotify too, but you can't access it as it is not available for Indian users. When it comes to India, we're still far behind some quality websites and software. There are many streaming sites which helps in listening music and videos and for free. You can use Gaana, Saavn, YouTube for streaming music and videos. But we haven't many choices to choose from. Sometimes it will be difficult to find and listen some awesome songs provided by Spotify or other streaming service which is not available in India. Just like Spotify, Netflix is also not available in India and many other countries. In this post I'll tell you how to access Spotify in India or any other country where it is not available. It is very easy to get access by using Proxy or VPN services. Anyway, it is not legal to use these services in India, for now. So, it is better to not subscribe to any subscription as you might lose money. But, you listen giant collection of music available on Spotify for free without subscribing to any plans. Now, if you would like to use it, than follow the steps given below carefully. Prerequisite: A Google Chrome web browser. If you haven't already installed it on your PC than download and install it from here. 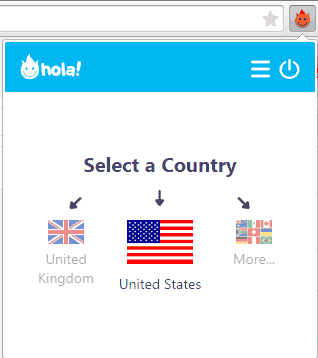 Now, install Hola Better Internet on your Google Chrome. You can download and install it from this link. Tip: There are many other extension available which provide VPN Proxy service, if this extension didn't work than you can try other extension like Proxmate. Next, make sure Hola is turned on. Click on the Hola Icon which is in the right side of the Chrome URL address bar. If the Hola is turned off than it will ask you to turn it on. Do it. After that it will ask you choose a country. Choose United States as it is the best option. If everything worked correctly than you will see a US flag on the right side of the URL bar. Now, go to Spotify website and register a new account. You can now download the Spotify desktop app on PC. Now what? Install the app and sign in with the Spotify Account you just created now. Spotify only verifies country during registration which means you'll not need to use proxy after registering an account. Now you can open the Spotify app and listen to the wild collection of international songs for free. But, every person don't use PC for listening to songs. if you're like me who never listens to songs on PC than you can download the Spotify Android App. If you would like to listen to songs on your Android Phone than follow the steps given below. Register for Spotify account as it is explained above. Download the Spotify app for Android. You can use number of online sources to download android apps outside Play Store, if you're downloading for external source than make sure you trust the source. You might like to read some tweaks to Direct Download Play Store APK Apps. Install the Spotify APK app on your Phone and sign in with your Spotify Account. Try this. I know you'll enjoy using it. Share this tweak to your friends. If you face trouble, please do share it on comment below.